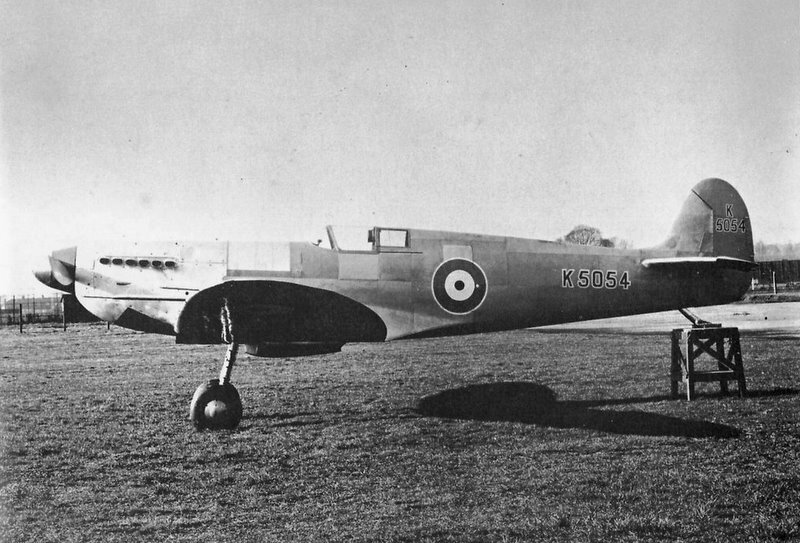 K5054 Spitfire prototype pictured in Eastleigh in March 1936, in the form in which she made her maiden flight. This is a rather well-known photograph, but arguably the one that no serious Spitfire monograph could do without. It shows the K5054 Spitfire prototype pictured in Eastleigh in March 1936, in the form in which she made her maiden flight. At this time the aircraft was unpainted and lacked fairings on the undercarriage legs. Besides the rather apparent fact that the aircraft on the photograph was unpainted, the exact colour shades of the prototype are still open to speculation. The tonal difference between the cowling and the rest of the fuselage may suggest that while the cowling was natural metal, the rest of the airframe was not. This lead some authors to the conclusion that the fuselage plating was covered in some sort of primer, probably a non-covering greenish yellow zinc chromate finish. On the other hand, it is worth noting that this and the other photos of the same session were taken with a very low sun (evening?) and the aircraft in the above photo is turned directly into the sunlight, which inevitably exaggerated the shadows and tonal differences along the fuselage. Other clues seem to contradict the primer hypothesis. The reflection of the undercarriage in the wing’s lower surface, indicates the very shiny, probably natural metal, surface of the latter. Also the fabric rudder appears similar in shade to the rest of the fin. It would be natural for a fabric surface on a British aircraft of the period to be painted in aluminium dope, which would make it match the metal surface of the fuselage. On the other hand, if the fuselage was covered in any anti-corrosion metal primer, it is rather unlikely that the same finish would also be applied to the rudder. In sum, the guessing is bound to continue. A friend who used to work for Supermarines at Eastleigh told me that the a/c was originally in silver dope – pretty standard for the time, except the cowlings which were still in grey primer. All of which is simple and makes perfect sense.